Happy Friday, everyone! I have been a busy little beaver lately. I finally decided to take the plunge and attempt to learn how to make a video. 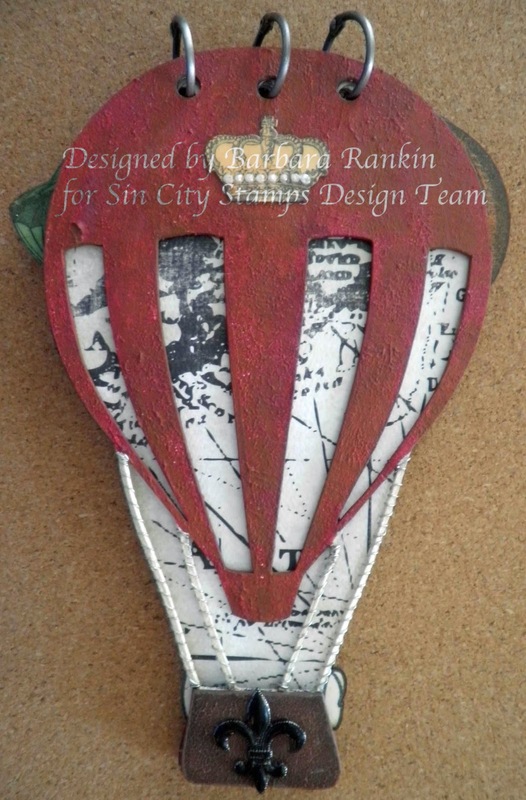 I wanted to share with you this new Hot Air Balloon Chipboard Book from Sin City Stamps, as well as one of the newest stamp plates to go along with it, Up Up and Away 2. There is lots of room to further embellish your book, add photos, quotes, or whatever you want to add to it. Here is my first video attempt, and I hope you enjoy it as much as I enjoyed making it for you. Thanks for watching, and please be sure to visit the Sin City Stamps Online Store to see all the newest products, not only their new stamps, but also tons of new chipboard and die cut pieces for your crafting enjoyment. And I hope you will visit the SCS blog often for lots of inspiration from the rest of the team. Have a wonderful weekend, and happy crafting!! Barbara this is amazing congrats on your first video It was awesome and I love the piece, great job! Well done Barbara! Excellent video and project! Can't wait to see the finished book!! Barbara I can't believe this is your first video, you did a great job! Your project looks amazing... Really liked it! Barbara... I can't believe its your first video either.. It is great.. I love your mini album.. I will be sharing this and pinning it .. wowzer!! !